Multi-color boots better than ever! I made myself a pair of brown boots with laces several years ago. Unfortunately I didn’t make the pattern quite right, so even when the laces were laced as tightly as possible, the boots still had too much room in them. I didn’t like the way the sides slumped down, so one day I decided to cut the strips of leather off between the two rows of eyelets. At least then I could tighten the laces so the boots would fit! However, they didn’t look too good with that chopped-off strip quite visible down the front of the boot, so I decided to put a leather flap across the eyelet area, which would snap to the boot. I found enough matching leather for the two flaps, so they were stitched in place. That looked pretty good, except it became clear that one flap wasn’t enough, the thin edge between the eyelets was still visible higher up the boot. I thought a flap that fastened with buckles might look better than two with snaps. Then, since I had no more of this particular brown leather, I thought I would use another color – and I had a mauve-purple that looks good with anything I wear. So, the purple flap was installed. But the little mosaic look “contrived”… Since I was soon to do a quickie shoemaking workshop for a group of students at Rhode Island School of Design, I thought – I’ll present my design dilemma to the students, and ask for their advice as to how to best bring these colors into my boots! And, I got a couple of really exciting suggestions that I have now incorporated and I’m so pleased with the results! One student said, “Change the color of the tab at the heel to one of the other colors you want. Another student said, “Put colored leather strips around the edge of the lower flap.” I realized that their thoughts involved making color accents more integrated into the boot instead of being an “artsy” design plopped down onto the front of the boot. So here’s how my boots look now. I love them, I wish I could do nothing but make these boots with custom color accents – but maybe one of you reading this will turn this idea into a thriving business! 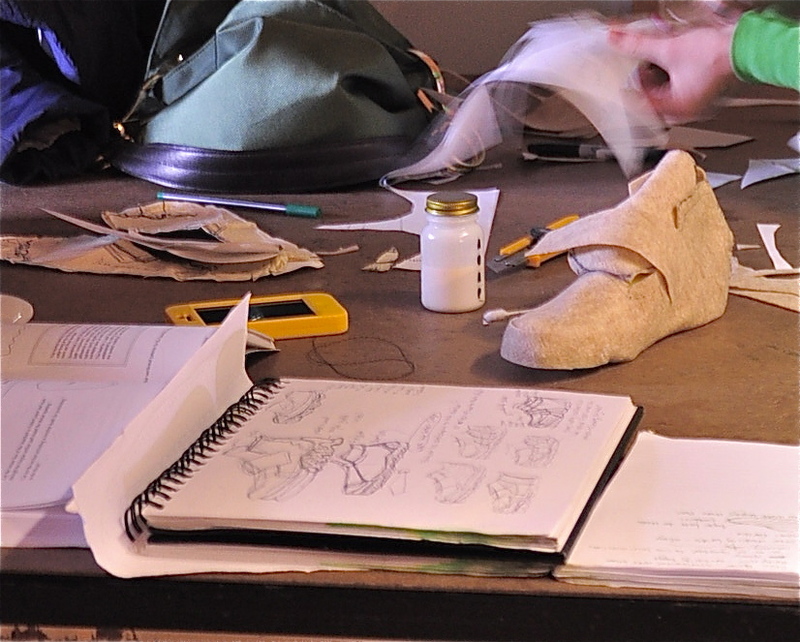 What a joy it was to walk around the classroom and see the sketches of shoes made by Rhode Island School of Design students who had returned the previous day from a Shoe Design tour of Italy. I had the thought, “how can there be a fresh way of looking at footwear, as so many millions of designs have already been made”. Well, I learned that there can be, I saw it in their notebooks. Take the average “derby-style” shoe; it usually has a clean curved line between the vamp in the front and the heel section. Well, what if that line undulated in and out between the two shoe parts – I can’t wait to see it made. I have to wait until February 8, at which time there will be a critical evaluation of the shoe that each of the twenty students will make as , and an evening presentation. I look forward to being there and taking photos so you can marvel at the results as well as myself. 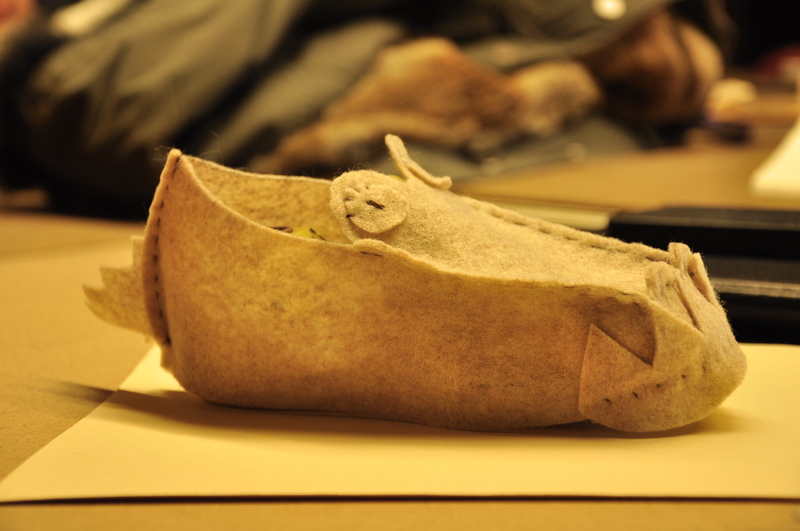 I had some confusion about the purpose of the tour and the make-up of the class; I had imagined that the students were aspiring shoemakers who had learned how to make shoes “the Italian way” on their trip. I thought I was there to show them a “simple shoemaking option” they might use in making their presentation shoe. Instead, they were design students from many different fields of study, such as Industrial Design, who wanted to focus on shoe design as inspiration for a new way to look at projects they were already working on. So, instead of teaching “simple shoemaking”, I took the audacious step of teaching “complex shoemaking”, meaning that the bottom edge of the shoe upper was made longer, then wrapped around the last to be cemented to the bottom of the topsole that had been nailed to the bottom of the last. I have almost never made a shoe using this technique, but with the simple materials that we were working with it worked out fine. I brought children’s lasts for the students to practice pattern-making on; they were instructed to cover the lasts with two layers of masking tape lying in different directions for added strength, then to draw their shoe onto the tape. Once that was accomplished they used an X-acto knife to cut their pattern off of the last. They then attempted the task of changing a 3-dimensional object into a 2-dimensional pattern. After learning some basics of this process, they made their pattern, then a felt “mock-up” of their shoe. This required some ability to envision the finished project, and therefore put seams where the shoe parts overlapped so the parts could be stitched together, as well as to add the 1/2″ to the bottom edge of the upper for adhering the upper to the bottom of the topsole. By the end of the day many cute little felt shoes began to materialize. For some of the students, creating a unique sole was an important part of the design of their shoe, so for that they will have to explore in other directions as I have no experience with making soles from anything beyond a flat sheet of material (usually natural rubber). Yet viewing the woodworking and other studios we passed through on our way to the classroom, there are ample resources at RISD for making just about anything that one can visualize. If only all the students in the American school system had access to such richness of materials and instruction for creative inspiration! 1. I have my facebook business page functioning, so i was ready tonight to send out a one-time mailing, inviting people whose addresses are in my address book to take a look. I look forward to seeing who remains interested in simple shoemaking. Having a business page is still confusing to me, I can accept “likes” but I can only “like” other businesses, not people – so it seems I can’t show my appreciation for those who “like” my page by “liking” them back! 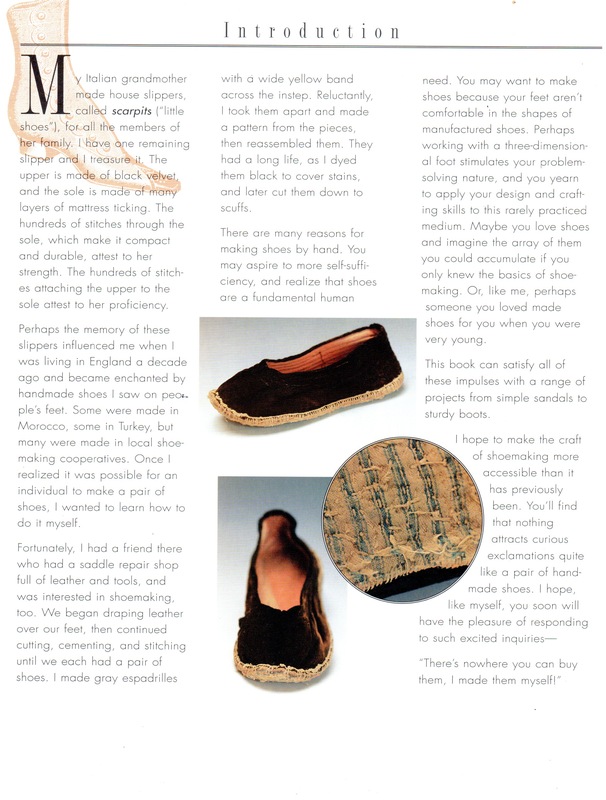 But I do so appreciate hearing from someone who has an interest in simple shoemaking… thank you. 2. On Tuesday, I am giving a “workshop” at Rhode Island School of Design to a group of students who are just returning from a design-trip to Italy! Each of them are using their design ideas to make a shoe that soon will be part of a group presentation. This is so exciting for me – it’s like Project Runway (I never miss that show – and it starts again tonight) for shoes! I plan to bring shoes I have made so they can see what the “stitch-down” process is like. I’ll also demonstrate how to make a shoe using Soles with an Edge, and using the traditional fully-lasted method (just a quickie; I don’t have much interest or experience making more complex footwear). Then, I’ll show them how to make a mock-up shoe with felt, cardboard, and non-toxic cement. I have a friend/photographer coming with me, so I expect to have a lot of photographs to share from this day – and then photos of the final creations. 3. Finally, my mother has ankles that swell, so purchasing footwear for her has become quite challenging. Imagining there are many other people with this problem, I’m working on a generic pattern that might prove helpful in making footwear for them. I’ll post it soon. If anyone would like to try it out during the “design stage”, please get in touch. I love the work of Natalie Chanin (www.alabamachanin.com) and how she has shared the details of her hand-stitching process in three inspirational books. Adopting her nonchalance, I no longer concern myself if the ends of my threads are visible on the outside of my work – which is a big boon to a shoemaker since knots left on the inside might irritate the foot. Transparency of the process is her way of working – and might that inspire us to reveal our inner process as well? Above is a pair of flats that I made using Natalie’s process of reverse applique, note the dangling threads! Well, I hope that this isn’t too forward, but I was wondering I could just ask you a few questions about your livelihood. I am a craftsman and artist of sorts, having always been a little in search of what I am best at, and what can also help me support my family. I had a little light turn on in my head about trying out shoes, and see that you may be approaching it similarly to how I would like to. Do you support yourself with shoe-making? Did you apprentice or find your own way? What was your most valuable resource? Which of your how-to books would you recommend I begin with? I am a mother of two, and my husband and I are going to be growing our family with little money while “aiming” for a craftsman’s lifestyle (he would be wood-working and blacksmithing). I at least want to have to satisfaction of making a pair of shoes per family member! A shoemaker who repairs shoes, rather than manufacturing them (see cordwainer for a discussion of the distinction). A cordwainer (or cordovan) is a shoemaker/cobbler who makes fine soft leather shoes and other luxury footwear articles. 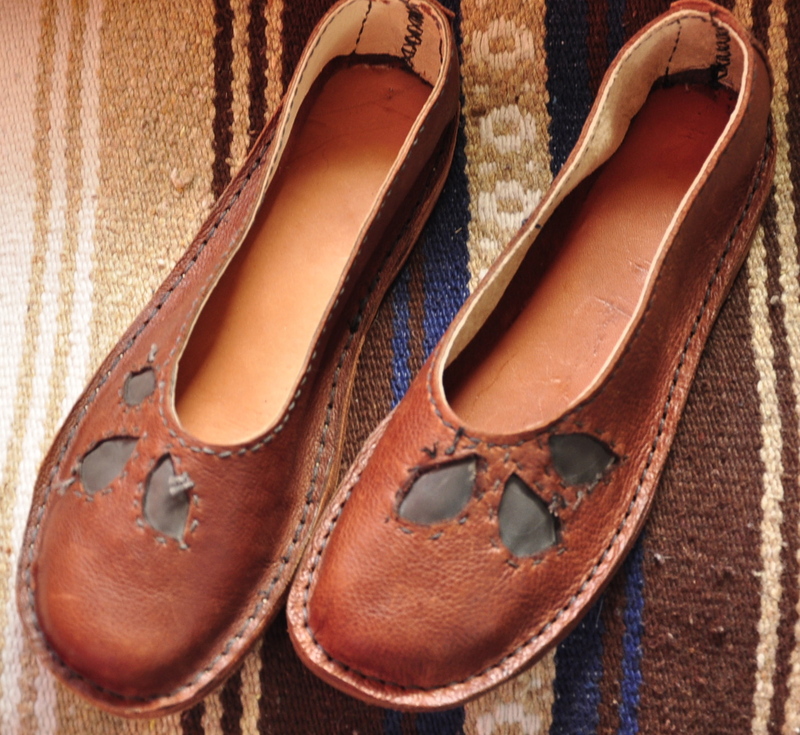 The word is derived from “cordwain”, or “cordovan”, the leather produced in Córdoba, Spain. 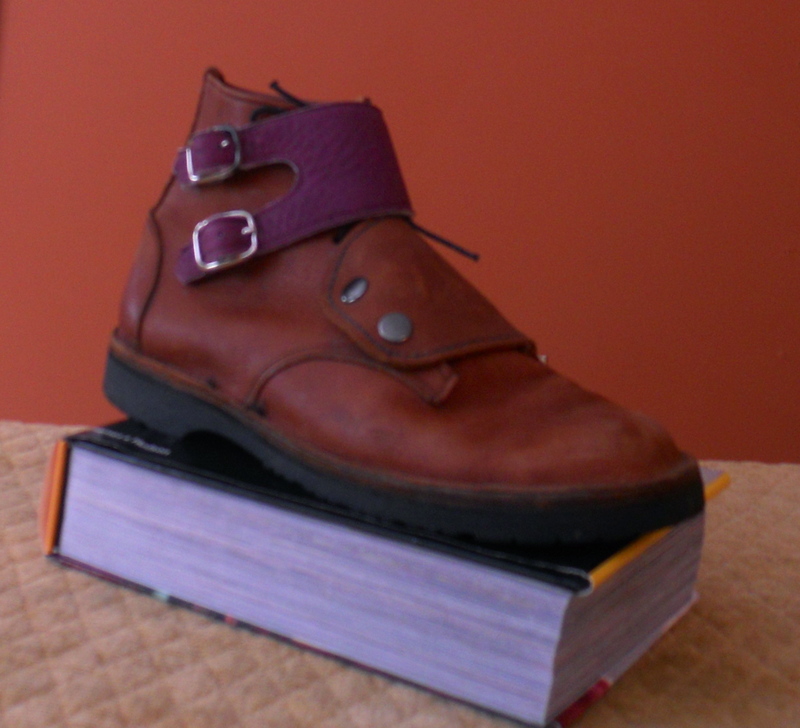 The term cordwainer was used as early as 1100 in England. Historically, there was a distinction between a cordwainer, who made luxury shoes and boots out of the finest leathers, and a cobbler, who repaired them. This distinction gradually weakened, particularly during the twentieth century, when there was a predominance of shoe retailers who neither made nor repaired shoes. So who can say, I might be a cordwainer, (I’m even a member of the honorable cordwainer organization, although you don’t have to send in a shoe you have made to gain admittance!) 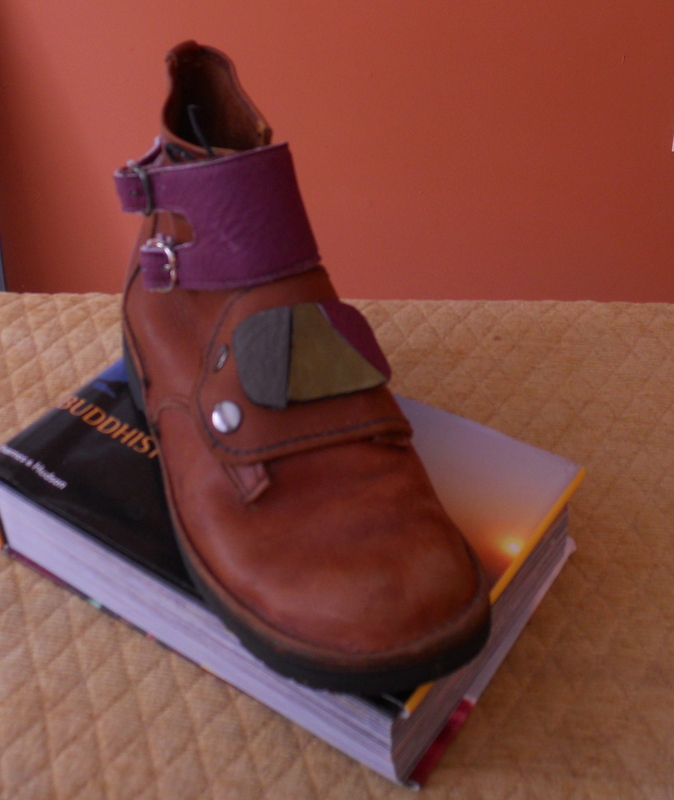 I have never made a “fine” or “luxury” shoe, however, so perhaps I’m simply a shoemaker. However, to answer your questions about livelihood, I now am devoted to the creation of more shoemakers in the world, not to the making of shoes. I am nearing 70 years of age, with arthritic hands, so it is time to pass on the knowledge and experience I have gained through the process of making “simple shoes” for almost 25 years. I have never fully-supported myself through shoemaking. I have a husband who has never expressed irritation at supporting my constant but erratic obsession with shoemaking. I am hoping that the vending of pattern books, DVDs, and the teaching of shoemaking will start to pay back for all his support, during our “retirement” years. So, my advice is to hone in on the shoe you want to make, then stick with it for a while. a long while. Of course look at all the hand-made shoe shops on etsy (most of them are from countries other than the U.S.A., where I gather there are more shoemaking schools – there must be quite a few schools in Israel!) Make something simple, work with simple materials, come up with a terrific name and logo for your company, take fabulous photos of footwear on the feet of members of your family, and open that etsy shop! I suggest that you start with my book “How to Make the Simplest Sandals for all the family with your own two hands”. Purchase the simple tools needed (see TOOLS AND MATERIALS LIST for “How to Make the Simplest Sandals” on my blog). Find pocketbooks or leather clothing at thrift shops to use for your first shoemaking experiments. 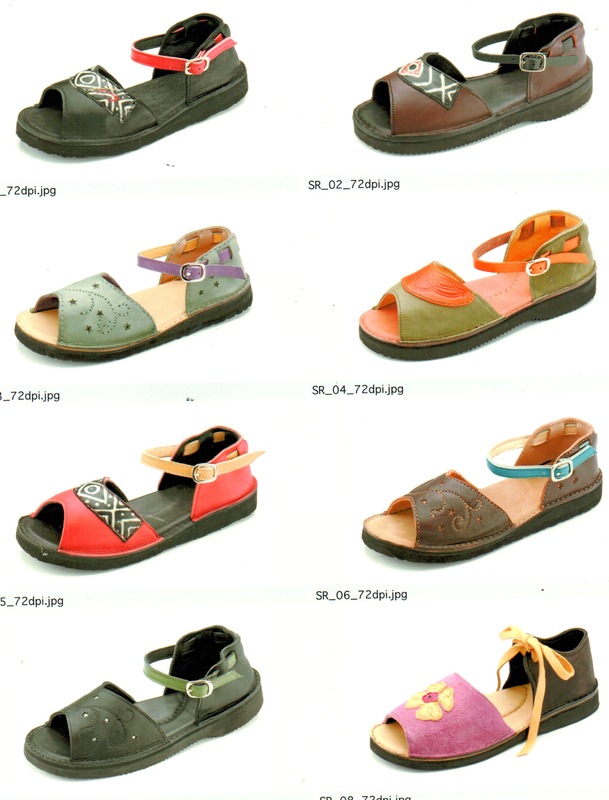 The fisherman’s sandal is a great first project – you can cut strips with rotary cutter if you have it, maybe in a variety of colors; and with inch-wide colorful elastic available now, you can create very special shoes “for Everyone”! My very best wishes for satisfaction, ease and insight (and financial reward!) while on your shoemaking journey. “Scarpits” was the name of the house shoes that my Italian “nona” (grandmother) made for all the family and required everyone to wear when visiting her home. 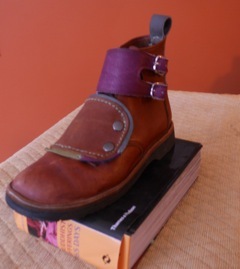 I dedicated Crafting Handmade Shoes to her, and described our relationship in the following Introduction to this book. 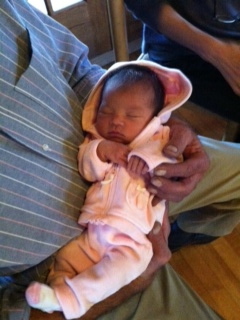 My first grandchild, Millena Tansy Strom, was born on Sunday evening, and I am still in a state of euphoria – even though I listened to a few moans too many from my dear daughter during the day. (she says it was totally worth it). I think she’ll be called Millie, and Lena was the name of my adored Italian grandmother (Nona) who made black velvet houseshoes for us. What a fascinating baby – we all can sit and look at her expressions for hours! It’s like a “Tom and Jerry” cartoon is running in her mind! What a miracle is life, may Millie’s always be filled with love. 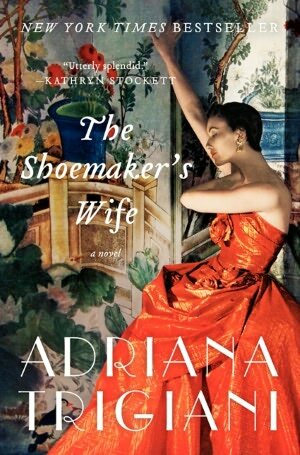 At an arts (and garlic) festival this fall, a woman stopped to ask me if I’d read The Shoemaker’s Wife. No I hadn’t, but I wrote down the title. Then she elaborated, telling me that she is Italian and that she especially loved the book because in it the author used the immigration story of her own ancestors from the mountains of Northern Italy to the United States as the basis for it. Well! my ancestors immigrated from the mountains of Northern Italy too! So I couldn’t wait to get the book, and when I did, I had such fun immersed in the glorious story. I even cooked polenta one night to eat while reading it. I recommend this book; one doesn’t learn a lot about shoemaking from it, but a lot about human nature and one family’s journey that represents so many others. There is a group of shoe and bootmakers that gathers once a year on the weekend nearest October 25, St. Crispin’s Day (the patron-saint of shoemakers, of course). This year the gathering was in Middlebury Vt, and I have just returned home from it. I went with specific questions that I wanted answers for, and I am so grateful that my questions were answered. I am in process of creating “soles with an edge” with a leather sole and heel, in addition to the natural rubber sole and heel that I have always made, and needed information on thickness and type of leather, how to make a groove around the bottom edge so the stitches wouldn’t be on the ground, and how to make a nice shiny edge on the leather sole. So, I’m looking for “5-7 ounce soling strips”, a sanding wheel for my dremel tool for making the stitching groove, and a “bone edger” for burnishing the edge of the sole, after a coat of “Vermont beeswax” has been applied. No doubt I will be doing a lot of experimenting this week! And there were many fine people to connect and reconnect with; Dan Freeman, the fine shoemaker, was the host at his shop in Middlebury; Larry Waller of www.walrusshoe.com who sells sets of lasts, shoemaking books and shoemaking machinery; Daphne Board of www.diabloshoe.com who is studying to be a pedorthist so the exquisite shoes that she makes will now be built to heal the wearer’s foot problems. Nancy Benoit – www.soleofvermont.com – is making (sorry, I have to use the word “exquisite” again!) exquisite flip-flops, flats and low-high heels at her shop in Manchester Vt. She serves special dinners in her barn during the summer, so I have already placed a note on my next-year’s calendar reminding me to make reservations – then I’ll also be able to see her very special shoe studio. There was a “bespoke (custom) shoemaker” who makes full-welted shoes with a shop in Brooklyn, a young mother who is preparing to have her line of shoes made in Eastern Europe, a shoemaker from Montreal who fooled all including myself into thinking that the designs on his shoes were applique, while in fact he stitched around the design, the dyed the leather inside the stitching! There was no applique at all, just very careful stitching and dyeing. I am enjoying looking back over the weekend and realizing how rich it was for me – perhaps you’ll be there next year! Converse “design it yourself” ads are all over web pages I go to: I say, “shoes somebody else makes are boring, make your own!” Why be stuck with choosing colors and maybe the location of a rivet or two? Start with my book, How to make the simplest sandals for everyone with your own two hands! And out of recycled materials, no less! 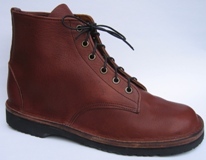 I was talking with a fellow recently who wants to make high end shoes for men. As I reflected on our conversation, the idea came to me that a brilliant business move might be to make the “fisher(man)” sandal, and make the heel section and toe-strap out of a neutral, less-expensive leather, then make the cross-straps out of more interesting colors and textures of leathers; perhaps the customer could select the colors and types of leather that he wants for the cross-straps from strips on display. His customized sandals could be ready in hours. The fisher sandal that is featured in “simplest sandals” has an elastic instead of a leather strap; great for women’s and children’s sandals, but not sufficiently “upscale” for the man’s sandal I am imagining. I’ll be working on making patterns for the fitted heel section and strap so it can be available for those who are intrigued by this concept. I did create a children’s pattern such as this one several years ago for an organization in Haiti; you can see the sandals in the young Haitian man’s hands, one pair I sent as a sample, the other pair he made himself.